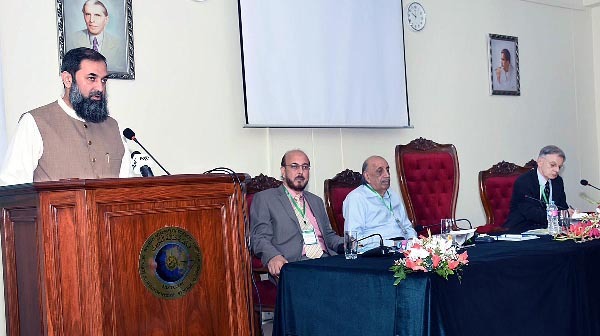 ISLAMABAD, Sep 27 (APP): State Minister for Education Engr Muhammad Baligh ur Rehman on Tuesday said that many of the infectious diseases are critical in nature and the recent emergence of Congo virus is a salient example in this regard. Speaking at the Joint Pakistan-US Workshop on strengthening and sustaining a network of public and animal health clinical laboratories in Pakistan, he appreciated the vision of Pakistan Academy of Sciences for addressing the issues of great national importance. He said, it is gratifying to note that agenda of the workshop covers a wide range of very important topics relating to safety and security of the clinical labs-both for humans and animals. bio safety and bio security at international forums. The present situation, he said, coupled with recent advancements in the Life Sciences, has placed today’s scientists in a position similar to that of the Atomic Physicists of the early 19th century. The research carried out in various areas of Life Sciences, and in Biotechnology in particular, can have profound impacts on generations to come, he added. Thus, countries have to think above their security challenges and move together to cope with these issues, emphasized the Minister. No matter how much we can do by ourselves on the national level, whether it is research of development, it is never enough. Do more in the spirit of true cooperation, we in this region of the world, need to nurture a society that is responsible in its conduct and is well aware about the recent trends in Life Sciences, stated the Minister. “We understand that it is time to renew contacts and discuss problems of mutual interest with delegates from a technologically advanced country, he said. It would also provide an opportunity to share knowledge on challenges affecting laboratory performance and to seek ideas for providing sustainable laboratory network systems and training of the scientists and clinicians in the country. It is inspiring that the Pakistani scientists have identified novel genes for skin, deafness, intellectual disability and Primary Microcephaly, etc. Baligh said. The research from these laboratories is published in high impact journals around the world. These findings are helping in disease prevention, early disease risk assessment, accurate early the diseases effectively. With the growing fear of pandemic and epidemic infectious diseases, scientists are using biotechnology to develop new diagnostic tools for rapid and sensitive detection of pathogens. Biotechnology is also used extensively in the study of emerging infectious diseases. The minister assured full support to see Pakistani’s laboratories becoming more effective in a safe and secure manner. He wish to see their responsible conduct and doing their business by practicing sound ethical principles. Ceremony was attended by Dr. Anwar Nasim (President of Pakistan Academy of Sciences), Dr. Dave Franz from US National Academy of Sciences, Dr Zabta Shinwari and eminent experts from USA & Pakistan.